The entire universe is made up of the ‘Panchamahabhutas’ ie: the five elements of nature. These are: Earth, Fire, Water, Air and Space. They are also known as Panchtatwa. 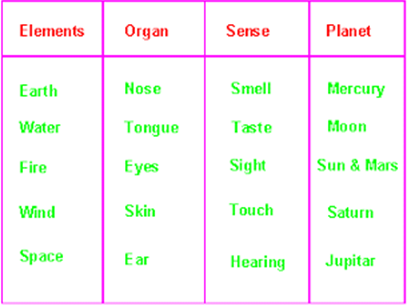 The human body has five senses of taste, smell, hearing touch and sight. These five senses are concomitant to the Panchamahabhutas. Vastu teaches the individual to live in synergy with these five elements of nature. It is the science of the arrangement of the five elements in any given place. Our venerated sages were well versed with the principle of energy and matter. They saw energy in every form of matter. This is elaborated in the vedic concept of Prakriti and Purusha, or soul and body. 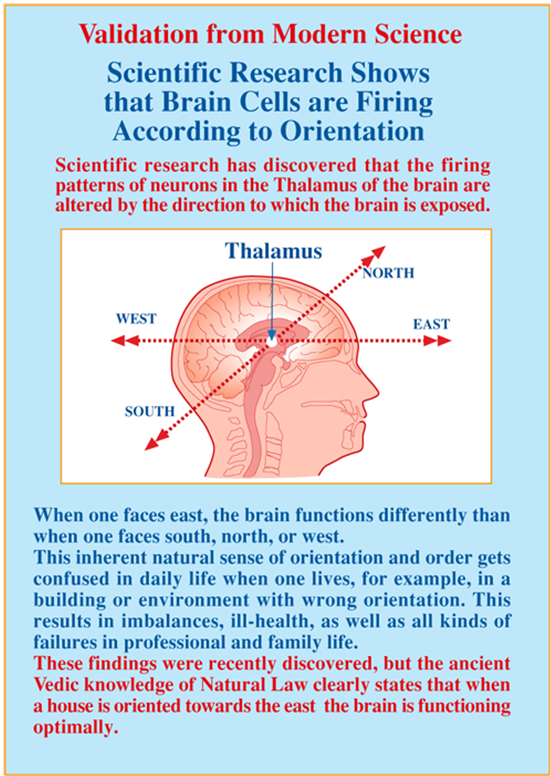 For this reason we have the concept of Vastu Purusha. Vastu Purusha is the prostrate figure which is the presiding deity of a given place, be it a home, an office, a shop, a factory etc. Vastu Purusha is controlled by 45 deities which are actually 45 different patterns of energies in a given place. 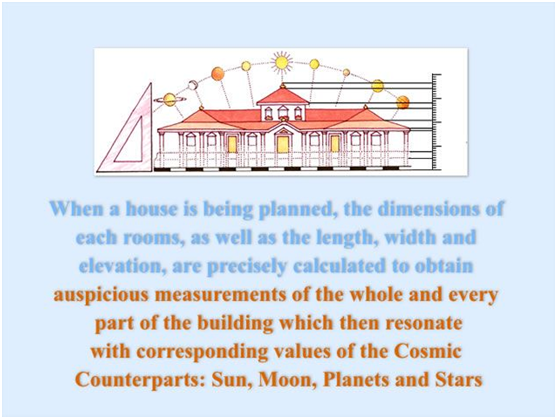 So it is not only the matter form ie the concrete structure, but also the energy ie Aura of the place which is taken care of in Vastu vidya. 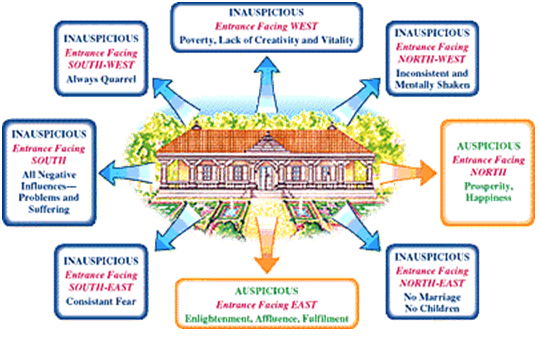 Thus Vastu analysis of any given place extends beyond the physical level. The Vastu Purusha’s head lies in the North East, the hands point to the North West and South East and the feet lie in the South West. Since hands signify activity, Vastu believes that work is best done in North West and South East. The head represents thought, so the North East is considered best for a puja room, and the South West where his feet are, is considered best for the master or the owner of the house. The navel of the Vastu purusha is the center of the plot. It should be left open. 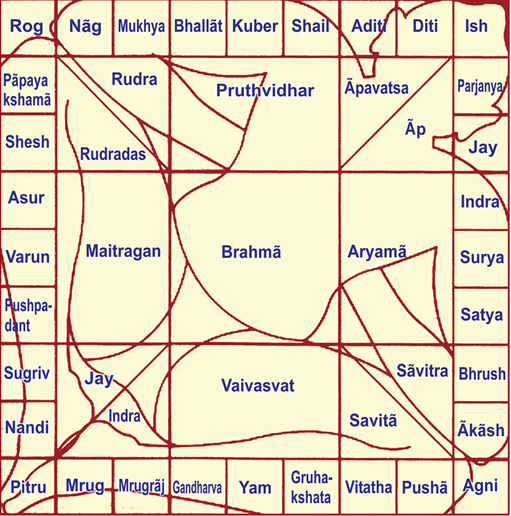 Vastu Shastra has its origin in Sthapatyaveda which is an Upaveda (supplementary branch) of the Atharva Veda. It denotes the establishing of a relationship between the dweller, the dwelling and the cosmos. The microcosm and macrocosm are built on the same plan. Just as an individual soul is encased in the living body so is the universal soul in the living prakriti nature. Among the various Puranas, which aim to complement Vedic literature, the Matsya Purana dated c. 250-500 lists eighteen scholars of Vastu. VesaraDesa was the land between the Vindhya mountains and the rivers Tungabhadra and Krishna and Vastu was taught here by Maya. DravidaDesa was Southern India where Vastu preached by Bhrigu was popular. Naga Desa was Northern India where Vastu was taught by Kashyap rishi. Among the 18 Puranas, Vastu finds references in MatsyaPurana, SkandPurana, Agni Purana, Garuda Purana, NaradaPurana, VayuPurana, VarahaPurana and BhavishyaPurana. The ancient sages in India made a deep study of the different aspects of nature and discovered a clear link between the perfect order in Gods creation and human life and activity. They also found that orderliness in nature could , if reflected in human life bring lasting and invaluable benefits. Vastu is a holistic science which is in full conformity with the entire cosmos and the flow of energy from all sources. It goes into all details, from determining the time for the worship of the land (bhumipujan) and commencement of building till the completion of construction. Let the science of Vastu redefine our lives and give us health, happiness and prosperity.